Somatostatin is a 14-amino acid peptide that inhibits pituitary growth hormone release. It is also called somatotropin release-inhibiting factor (SRIF). Peptide hormones are a class of peptides (short polymers of amino acid monomers linked by peptide bonds) that are secreted into the blood stream and have endocrine functions in living animals. Somatostatin is expressed in the central and peripheral nervous systems, the gut, and other organs. SRIF can also inhibit the release of thyroid stimutalting hormones, prolactin, insulin, and glucagon. It also acts as a neurotransmitter and neuromodulator. Somatostatin was used to test the therapeutic effects of novel vaccines for reducing weight gain and increasing weight loss in diet induced obesity (DIO) model. 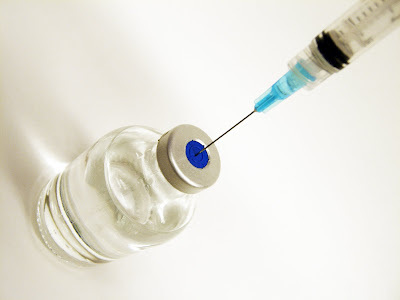 A new study, published in BioMed Central's open access journal, Journal of Animal Science and Biotechnology, assesses the effectiveness of two somatostatin vaccinations, JH17 and JH18, in reducing weight gain and increasing weight loss in mice. Keith Haffer from Braasch Biotech LLC, tested the vaccinations in two groups of ten diet-induced obese male mice compared with a control group of ten mice which received saline injections. Mice in all groups had been fed a high fat diet for eight weeks prior to the study and continued to eat the same food for the duration of the six-week study. The vaccinations were administered twice - at the start of the study followed by a booster vaccination on day 22. "This study demonstrates the possibility of treating obesity with vaccination", Keith explained. He continued, "Although further studies are necessary to discover the long term implications of these vaccines, treatment of human obesity with vaccination would provide physicians with a drug- and surgical- free option against the weight epidemic."